There is a new No. 1 in Class 5A this week as the top two teams in the 5A poll lost last week. We are one week away from solidifying the seeds for the new playoff format for Class 6A and 5A and there is still plenty to be decided. Here’s a look at the Kpreps Rankings for Week 8. There are no changes in the Class 6A poll this week as all five teams rolled to double-digit wins. Top-ranked Derby rolled, 56-7, over winless Salina South, while No. 2 Blue Valley defeated Blue Valley Northwest 42-7. Shawnee Mission East won the Sunflower League battle with Lawrence by scoring a pair of touchdowns late in the second quarter to pull away from the Lions, 48-26. Manhattan, ranked fourth, posted a 48-0 shutout over Emporia, while No. 5 Garden City won at rival Dodge City 36-13 to reclaim the Hatchet Trophy. The top two teams in last week’s Class 5A poll both lost last week by a combined four points. That opens the door for the Great Bend Panthers to take over the top spot in the 5A poll. 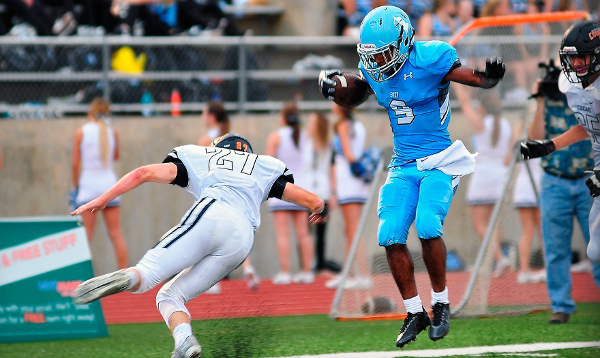 The Panthers had little trouble in a 49-7 road win over Liberal, but they will host 6A No. 5 Garden City this week. Bishop Carroll moves up a couple of spots to No. 2 this week after the Eagles scored with less than a minute remaining to edge last week’s No.1 Wichita Heights, 42-21. Heights drops to No. 3 this week after the one-point loss. Goddard moves up a spot to No. 4 this week after the Lions’ impressive 49-7 win at previously-unbeaten Valley Center. Finally, St. Thomas Aquinas falls three spots to No. 5 this week after the Saints were upset by Blue Valley Southwest, 30-27. Aquinas will try and rebound against 6A No. 2 Blue Valley this week. Topeka Seaman (6-1) remains just outside the poll after getting a late touchdown to beat Washburn Rural. In 4A, Division I, Bishop Miege retains the top spot after a 51-0 shutout at Eudora to begin district play. The Stags will travel to De Soto (6-1) this week. Basehor-Linwood moves up a spot to No. 2 in this week’s poll after a 48-34 win against KC Piper. The Bobcats scored 21 points in a wild final three minutes of the game which saw a combined 34 points scored. Buhler moves up to No. 3 this week after a 28-21 win over last week’s No. 2 Andale. Andale quarterback Taylor Richter left the game in the first quarter and did not return. The Indians fall two spots to No. 4 in this week’s poll. Maize South remains at No. 5 this week after a 21-14 win over Augusta. Once again the top three teams in the 4A-II poll remain the same. Holcomb opened district play with a 28-0 shutout of Kingman, while No.2 Frontenac rolled to a 55-14 win over Parsons. Columbus, ranked third, pulled away for a 42-14 win at Baxter Springs. Wichita Collegiate moves up one spot to No.4 this week, while Topeka Hayden re-enters the rankings at No. 5. The Wildcats (3-4) defeated last week’s No. 4 Santa Fe Trail, 27-6, and will take on traditional-power Holton this week. Scott City, Pratt, Holton and Santa Fe Trail are all just outside the poll in the deepest 4A-II field in the classification’s brief history. The top four spots in Class 3A remain the same this week, but we have a new No. 5. Nemaha Central slips into the rankings at No. 5 this week after a 20-14 win at Sabetha in a battle of unbeaten Big 7 Conference teams. The fifth spot opened up after Garden Plain’s 21-20 loss to rival Conway Springs last week. At the top, Hoisington survived a test from Ellsworth before pulling away for a 39-20 win, while Silver Lake had little trouble with Oskaloosa. Phillipsburg is a little beat up, but the Panthers had no problem winning at Thomas More Prep. Rossville remains fourth after a win over a solid Mission Valley team, 49-27. Friday’s ranked 2-1A battle went to Troy as the top-ranked Trojans scored twice in the second half to beat No. 5 Washington County 20-6. The Tigers played without star running back Hunter Kier, and remain at No. 5 in this week’s poll despite the loss. Troy will take on undefeated Jefferson County North this week in a game that will likely decide the District 1 playoff spots. Washington County must rebound for a road trip to Centralia. Smith Center remains at No 3. in this week’s poll after a 33-0 shutout of a beat-up Sacred Heart team. Lyndon stays at No. 4 after shutting out Northern Heights. The Tigers will likely play for the District 3 title when they host Chase County (5-2) this week. Once again there are no changes in the 8-Man, Division I poll this week. St. Francis remains a mere two points ahead of Spearville for the top spot in the poll. The Indians did not play this week, while the Royal Lancers rolled to a 72-24 victory over Satanta. Spearville hosts surprising Leoti-Wichita County (5-2) this week. The Indians have won four straight games in this their first season of 8-Man football. Burlingame remains in the No. 3 spot after a big win over Valley Falls. The Bearcats face a Rural Vista team desperate for a win to keep their playoff hopes alive. Osborne comes in at No. 4 this week after a 54-8 win over two-time defending 8M-II champ Victoria. Finally, Central Plains remains at No. 5 this week. The Oilers can secure an unbeaten Central Prairie League championship with a sin over St. John this week. There is all sorts of movement in the 8-Man, Division II poll this week. That is, except for the top spot. Top-ranked Hanover gave up points for a second consecutive week, but rolled to a 54-8 win over Frankfort. The Wildcats will travel to Wakefield this week for what appears to be the District 3 championship. Last week’s No. 2 ranked team, the Hodgeman County Longhorns lost 48-28 at home to Sharon Springs-Wallace County. As a result, the Longhorns dropped out of this week’s poll and Wallace County re-enters the poll at No. 5. That allows for Pike Valley to move up to No. 2 this week. The Panthers should get a test at Beloit St. John’s-Tipton (6-1) this week. Dighton continues to climb the poll to No. 3 this week. The Hornets remained unbeaten with a late touchdown to top Otis-Bison, 36-30. Tyler Lingg passed for 388 yards and four touchdowns in the victory. Finally, Hartford enters the poll at No. 4 this week after a second consecutive impressive performance. The Jaguars outscored Hutchinson Central Christian two week ago, and last week used a strong defensive performance in the second half in beating then No. 4 Caldwell, 56-42.